Kids and sailboats go together like ducks and water! There are so many cool sailboats out there for kids: optimist prams, 420's, Lasers, Sunfish, Flying Scots, Open Bics, Hobie Cats, the list goes on. Sailing combines skill, dexterity, and a sharp mind to harness the wind and make it to the finish line ... or just tool around the bay. 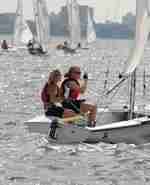 Many of last year's sailors went on to qualify for North Americans, British Nationals, Asians, Europeans & Worlds. After the regatta each team was challenged to turn the collective footage into a short web video. Explore and learn all about the Railroad to the Sea! 4 Youth Sailors Crowned with National Titles The final race of the 11-race series was sailed in a shifty westerly breeze combined with a one-knot current and chop. The challenging conditions were enough to upset the 420 standings but not the Laser and Radials leaders. Raider Daysailer Delivers Speed & Fun by the KidsAboard Boat Test Team. Learn about this cool sailboat that beginners and advanced sailors enjoy. Send us a story you wrote about sailing. We will publish it online!